Rosso, blu e righe: io sono innamorata di questo mix. Bellissima Lilli, outfit semplice ma molto chic! Delizioso questo look, le righe sono sempre vincenti!! You are wearing all of my favourites Lilli:denim , stripes and wedges. You look great! Have a wonderful day! sai che io adoro le righe bianco/nere o bianco/blu abbinate a scarpe o borsetta rossa?! So chic, love the outfit, perfect for spring <3 many hugs!!! Bello questo look navy-chic!!! Adoro le righe e il tocco rosso mi piace da impazzire!!! Bellissimo questo look Lilli, un abbinamento perfetto! Le scarpe mi pare di ricordarle, sono bellissime. E bellissima la mini bag rossa, l'adoro. So cute Lilli! I love the shoes! I missed you on Monday and was wondering why were there no new post! LOL! You're looking brilliant here, Lilli, super gorgeous as always and I love your shoes! GREAT outfit!! 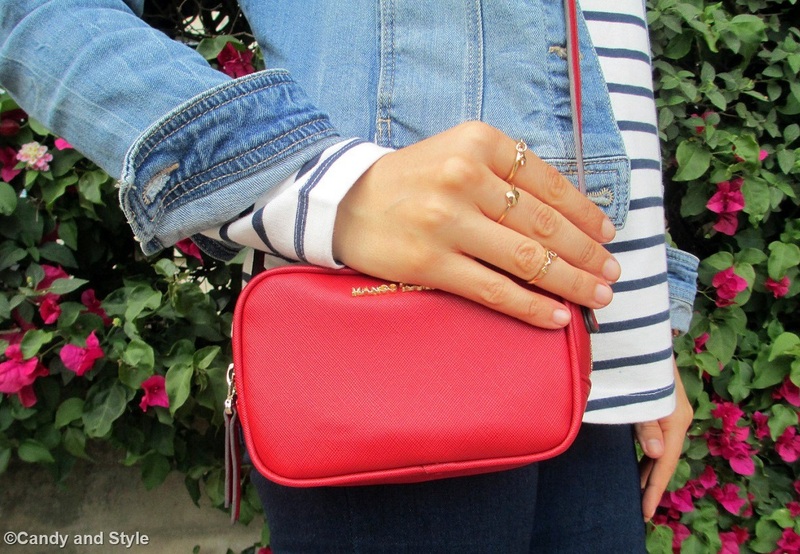 I looove stripes...and your accessories are sooo cute! La mia settimana è sfiancate, ho mille cose da fare e pochissimo tempo. Venerdi parto a Torino per il salone del libro...che ansia!!! What a lovely outfit!! !You loook so preety dear! I always like demin and stripes for Spring or Summer!! Love your shoes and your vintage earrings!! Have a lovely week ahead!!Hug!! Un mix tra righe jeans bianco rosso che non si può sbagliare. Bellissima! Your 'navy" moment definitely suits you Lilli! You look ever so chic and I love your white wedge shoes! Stripes always cheer me up as well :) Hope you're enjoying a wonderful week babe. I love that you are having a navy moment as you look amazing in it! When I first saw your first picture I thought it was from a magazine! Totally gorgeous! Blue and white with a little red is so classic! Adoro questo tuo momento navy Lilli, mi piace da matti il look in ogni suo dettaglio, non cambierei nulla! Bellissimo il giubbottino con la maglia marinière e la borsina di Mango rossa! Poi che meraviglia la bouganvillea dietro! Stripes, denim and a hint of red... one of my top favourites! :) You're gorgeous, Lilli! This wedges make an excellent team wth your legs! Amazing look! un look navy perfetto! adoro le righe..sei bellissima cara Lilli! e molto chic! 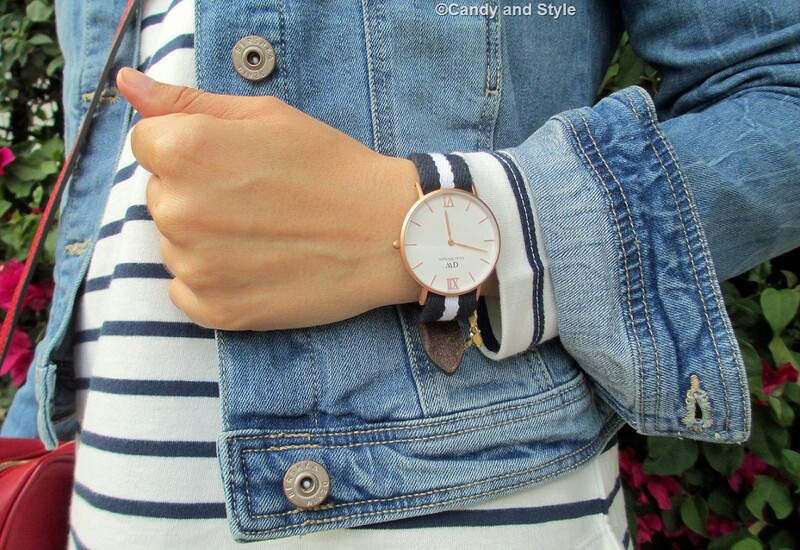 questo outfit è un mix delle cose che più mi piacciono: denim e righe! Poi il tocco di rosso (tra i miei colori preferiti, soprattutto negli accessori) e quelle scarpe che sai quanto mi piacciono! Mi piacciono moltissimo anche gli orecchini! You look so beautiful and chic Lilly; very lovely combination. Love the mix of blues! The shades are so pretty. Also love the pop of red. Hi Lilli! Looking super chic today.. love the denim on denim.. and great accent with the striped top.. clever combo! I adore the shoes too.. it's actually such a great match with the outfit.. can't go wrong with pointed shoes :) And aww.. I'm so jealous of your watch.. I really want my own DW watch. Have a beautiful day today sweetheart! My dear Lilli, I thing that when summer is just around the corner we all get in that navy/stripes/white mood and we just can't snap out of it! :) At least, I am! Ilove those navy combos for hot summer days and cannot help myself! Those Mango heels are my all time favorites of yours and they look awesome in every combo! Sei stupenda come sempre, cara mia! super carina con questo look, mi piacciono in particolare le scarpe molto belle esticamente e anche molto comode per il modello ! beh io sono una fan di questi colori quindi non può che piacermi il tuo look di oggi! I love your hair in these photos, as well as your shirt! I am looking for a dress version but it's not easy to find the right one. Lilli bellísima, I Love you navy and casual outfit. Nice with wedges and little red bag. ce carina la maglietta a righe con il giubbino di jeans...e quella borsetta rossa?!?! adorabile davvero lilli. Your bag and those wedges are soo nice!!! ...a me piace molto lo stile navy!! !...e mi piaci con i capelli così!!! I love the bag<3 you look awesome!